A version of this digital text in Spanish is available here. 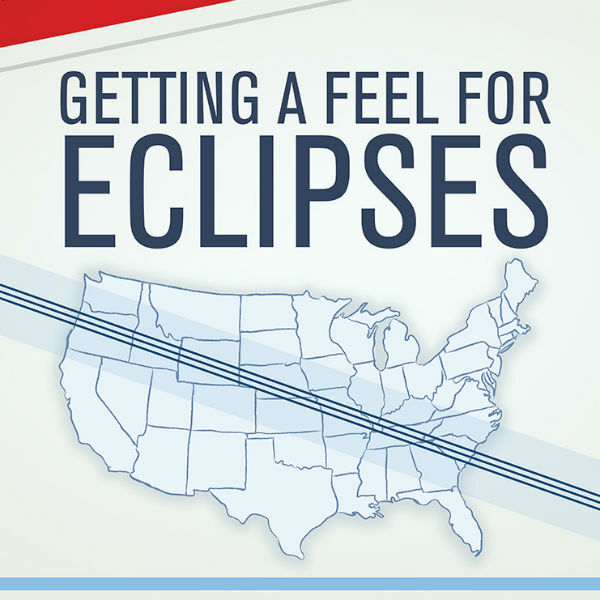 Getting a Feel for Eclipses explains details surrounding the August 2017 total solar eclipse. The path of this eclipse will travel directly across the continental US, from Oregon to Charleston, SC. To commemorate this event we have created a tactile guide. Tactile graphics provide an illustration of the interaction and alignment of the Sun with the Moon and the Earth. Associated activities will clarify the nature of eclipses. For thousands of years, humans have observed the sky and wondered.. Particular alignments of heavenly objects were seen as signs or omens. Perhaps one of the most awe-inspiring and influential celestial events to occur is a solar eclipse. In the coming years, significant solar eclipses will be visible from the United States in 2017 and 2024 and from South America in 2019 and 2020. While this tactile book is focused on the 2017 eclipse it is also relevant for other future eclipses. Come and explore the world of eclipses with us! A solar eclipse occurs when the sunlight reaching the earth is blocked by the moon. It is important to understand some basics of the orbits of the earth and moon. The earth orbits, or revolves, about the sun. It takes about 365 days for the earth to revolve once around the sun. The moon orbits, or revolves, around the earth and takes about 29 ½ days to revolve once around the earth with respect to the sun (referred to as the moon’s synodic period of revolution). As the moon orbits around the earth on nearly the same plane as the earth and sun; the moon is found between the earth and sun about every 29 ½ days (as shown on Tactile 1). When the moon is found there, it is called a “New Moon.” A solar eclipse can only occur during the New Moon phase. Various types of eclipses occur four to seven times a year with most years only having four. However, the type of eclipse being explored with this book is known as a total solar eclipse which occurs somewhere on earth about every 18 months. The problem is that an observer is rarely in the right position on earth (or within the path of totality, Tactile 1 and Tactile 3) to witness the entire disk of the sun being blocked by the disk of the moon (Tactile 2). It is so rare that if the observer were to stay in one place on earth, he/she would only be found in the path of totality about once every 400 years! You might be wondering why an eclipse doesn’t occur every New Moon which occurs every 29 ½ days. The reason is that the orbital plane of the moon and earth is tilted by about 5° from the earth and sun orbital plane. This causes the moon’s shadow to usually fall either above or below the earth. How long do solar eclipses last? “Totality,” or when the disk of the sun is entirely blocked by the disk of the moon, can last up to eight minutes though most of the time totality lasts about two to three minutes along this so-called “path of totality.” Totality for most of the United States on August 21, 2017 will last over 2 minutes. However, from the start of the eclipse in which the sun is partially eclipsed by the moon until the end of the eclipse when the disk of the moon no longer blocks any of the sun takes about 2 hours (as shown on Tactile 2). For example, during the eclipse of 2017 on the west coast in Oregon, the partial eclipse will begin about 9:05 am Pacific Daylight Time (PDT) and end about 11:36 am PDT. For that same location, totality will occur between10:16 am PDT to 10:18 am PDT. On the east coast in South Carolina the partial eclipse begins about 1:18 pm Eastern Daylight Time (EDT) and ends about 4:10 EDT. Totality along the east coast runs from about 2:46 pm EDT to 2:49 pm EDT. Get complete details regarding specific times for specific locations across the United States and region! Although being in the path of totality and knowing specific times will make for a great experience, an observer should also pay attention to local weather forecasts to find a location within the path of totality where it will likely be clear skies! Are solar eclipses dangerous to look at? Yes! It is never safe to look at the sun without proper means of viewing it. During a total solar eclipse, for people in the “path of totality,” the only time to safely look at the event is during totality when the disk of the sun is entirely obscured by the disk of the moon. At this time, a layer of the sun’s atmosphere called the Corona is visible to the unaided/unprotected eye. As the middle graphic in tactile 2 illustrates, the Corona can be seen radiating around the sun while the central disk remains black. Normally, the photosphere of the sun’s atmosphere outshines the Corona. It is interesting to note that the Corona can extend out over 4 million km and can reach temperatures over 2 million degrees! Aside from the few minutes of totality, it is never safe to look directly at the sun. Even an annular solar eclipse (as described in next section) can damage the eyes if it’s looked at directly without filters. It should be noted that it is never healthy to look directly at the sun and care should be taken to work with professionals who have some experience using proper methods of viewing eclipses of the sun. What’s the difference between a total solar eclipse, an annular solar eclipse, and a partial solar eclipse? During a Total Solar Eclipse, the moon completely blocks the sun. Even though the sun is about 400 times larger than the moon, the disk of each is about the same size in the sky as viewed from earth because of the distance each is from the earth. Given that information, which one is farther away and which is closer? Of course, Tactile 1 provides an answer, but be aware that it is NOT to scale by size and NOT to scale by distance. The orbit of the moon around the earth is not a perfect circle but an ellipse. Therefore the moon is sometimes closer to the earth and sometimes farther.. If the moon is farther from the earth during a New Moon phase then the disk of the moon is not large enough to cover the entire disk of the sun. When this occurs it is called an Annular Eclipse. As expected, during a Partial Solar Eclipse, the moon only partially blocks the sun. Technically a Partial Solar Eclipse means that no viewer on Earth can be in the right location to witness totality. Practically speaking, however, the moon will “partially” block the sun for a large portion of Earth during a total solar eclipse or even an annular eclipse. For example, during the August 21st 2017 total solar eclipse the entire United States including Hawaii and Alaska can witness a partial eclipse by using proper viewing precautions. Tactile 3 outlines the contiguous United States and also the specific path of totality. The amount of obscuration that occurs gets less and less the farther an observer is from the path of totality.